I am excited about the role People Analytics will play in transforming organisations. I have seen some real success stories where organisations have incorporated more data-driven decisions about people and work. David Green highlights some great case-studies in his article, 20 People Analytics case-studies, which includes, Virgin Media, who reduced sickness absence rates from 9% to 4% saving the business £750,000. There is clearly a journey to be taken where we move from our current starting point, where we often distrust the data we have on employees, to a place where we can better predict sickness absence, attrition and productivity. Most organisations are already on this journey to some degree. The percentage of companies that believe they are fully capable of developing predictive models doubled this year, from 4% in 2015 to 8% in 2016, according to research by Deloitte, “Global Human Capital Trends 2016”. However this journey will have some challenges that we will need to overcome. People Analytics can play a key role in reinventing organisations. However we need to resolve some of the structural challenges to truly succeed. I covered some of these themes in my recent presentation, The Role of HR in Reinventing Organisations: Embracing People Analytics, at the Workforce Analytics Summit in Sydney. Despite the hype, there is low adoption of People Analytics at the moment – here are some of the challenges that I think we need to address and also some suggestions of how WE (in the broadest sense) can overcome these challenges. As always, I would welcome your views on the challenges, and especially ideas, and examples of how to overcome them. "80% of HR practitioners say their company leaders still rely on 'gut feelings' to make people-based decisions" according to a survey of Human Capital Institute members in partnership with Oracle. What’s wrong with using ‘gut-feelings’ to make people-based decision? Daniel Kahneman, in his book – “Thinking, Fast and Slow“ described two main types of thinking well with their inherent biases. So back to the challenge for those with skills in People Analytics, if your business customers do not believe that data is useful then they will not ask for it, or use it, or believe in it. Which is a fairly big challenge! So how do we overcome this challenge? Maybe there is a middle way between the fast and slow lane? Make sure the boss ‘gets’ using evidence-based data. If you are the boss, then make sure your new hires also ‘get’ it. In HR we have always had business problems, statistical knowledge and access to piles of data, so why the hype around People Analytics now? Well the Cloud and Big Data sales machine is probably talking to your boss right now. You know the pitch, “Analytics pays $13.01 for every dollar spent”. Managing expectations on people performance with the CEO should be your job and as mentioned, People Analytics has delivered some good early results, but one of the biggest dangers right now is far too much hype. 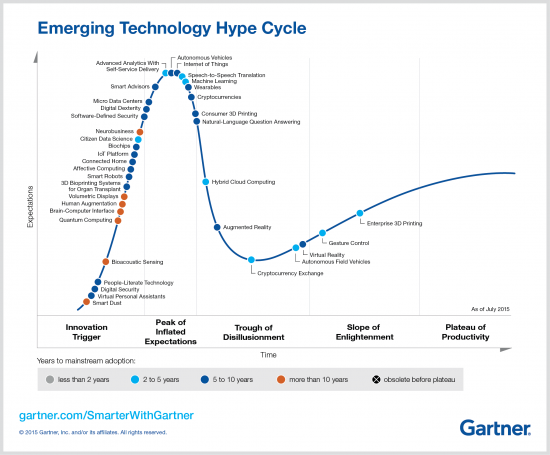 Since 1995 Gartner has been measuring The Hype Cycle, the promise of emerging technologies, and shows five key phases of a technology’s life cycle. Is People Analytics in danger of succumbing to the hype before it delivers benefits? So what if the CEO gets excited about HR once in a generation you might say? What happens if we set expectations too high for People Analytics and do not deliver? It will not be the first time that HR has over-promised and under-delivered based on “best-practice”. At some point you will need new recruits in a competitive market which needs new software, but there’s only so many times you submit a business case with a decent ROI. What you really need is some early positive results. Set realistic expectations on people analytics – aim low and over-deliver. There is a danger that People Analytics is a solution looking for a problem and in the “scientific method as an ongoing process”, the generation of interesting questions is a key step. To do this we need to know the business. I had a client a few years ago, who trained a group of HR Business Partners as 6-Sigma Black Belts. After the training, they demanded a data dump from Peoplesoft. "What problem are you trying to solve?” and the reply was “We don’t know yet until we see the data…”. The example highlights the need to solve business problems not analyse data. Strategy is all about making choices, so if you run an analytics team, generate as many questions and hypotheses around a particular problem area as you can by casting the net widely. This paper is worth reading, “HR and Analytics: why HR is set to fail the big data challenge” (Angrave et al, 2016) published in Human Resource Management Journal. In other words, our HR Systems, data and reporting tools might not help us answer the business questions we have. Many HR operational systems were simply not designed for analytics, and although they are improving, I expect to see more sophisticated analytics functionality in subsequent software releases. What we are crying out for is a theoretical framework to test our hypotheses about people, behaviour, productivity and organisations. We are not there yet, but I am optimistic that over the next few years we can develop the skills and knowledge to increase our confidence levels in people management. Stop doing people analytics until you’ve fixed your frameworks. The problem is, you can show the C-Suite pretty data visualisations of their organisation showing attrition, gender balance, and average commuting time, but the hard truth is the CEO will only really listen when you link it to Revenue and Profits. When it comes to employees, the holy-grail is increasing employee productivity. We need to link as much as possible to employee Productivity to get ‘buy-in’. I have been speaking and writing about some of the structural issues with HR Operating Models for many years (see for instance, Is your HR Operating Model Fit for the Future? If the supporting structures for HR analytics are not in place, then the probability of success is lower. Working in silos. In HR we have developed some great experts over the last few years (e.g. talent, learning, reward etc) yet we have also become a function of specialists creating more silos which makes it harder (not impossible) to work together as a whole to deliver HR (Business) strategy. The role of HR Business Partner. The role was introduced as a strategic partner and account manager for HR Services, however there have been challenges. Many orgs are on their 3rd or 4th revisions of this role and HR BPs are key to solving business problems as key customers for an analytics service. However we are in a transition phase, as described by “Most HR BPs won’t cut it…” from Luc Smeyers and “Stop Hiring Data Scientists if you’re not ready for Data Science” from Greta Roberts. We will never have the optimal HR Operating Model with managers, systems, HR experts working seamlessly together. However we can strive to continually improve the model using People Analytics to help rethink many of our HR programmes and influencing how we deliver our people management. Ensure Business Partners have good analytical skills and are inquisitive about the business. Provide coaching on basic statistics and people analytics where needed. My “gut-feeling” is that People Analytics will help reinvent organisations. We are in the early stages of a journey and we can all help by sharing methods, learnings and positive results. We need to keep an eye on some of the near-term challenges as we move forward. One key action within our control is to set realistic expectations and solve specific business problems. This can get our business partners more interested into a different way of working. The technology industry will probably evolve to roll-out improved offerings with time. And our evidence base should get better as we improve data quality and start to ask better informed questions. Although the ecosystem I refer to is complex, with diverse vested interests, we should continue to encourage sharing and collaboration as much as possible. Here is a presentation on "7 Challenges that People Analytics Must Overcome" I gave at HR Congress Amsterdam in November 2016. This entry was posted on Thursday, September 22nd, 2016 at 11:50 am	and is filed under Cognitive Diversity, Future of Work, HCM, HR Blogs, HR Business Partner, HR Conference, HR Strategy, HR Tools, HR Transformation, Leadership, People Analytics, Productivity, Quantified Workplace. You can follow any responses to this entry through the RSS 2.0 feed. You can trackback from your own site.